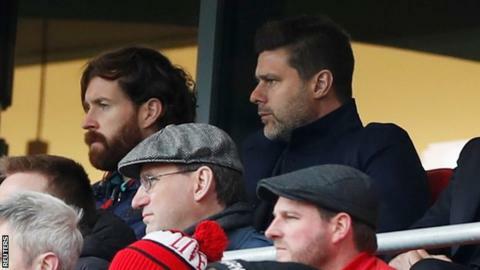 Tottenham manager Mauricio Pochettino says his side’s chances of qualifying for the Champions League remain “in our hands” despite defeat at Liverpool. Lucas Moura cancelled out Roberto Firmino’s Liverpool opener, before Toby Alderweireld’s 90th-minute own goal. The four teams battling for two top-four places, including third-placed Spurs, are now separated by one point. “We are disappointed but the emotion and feeling will help us,” said Pochettino after Sunday’s loss. Tottenham have 61 points, the same number as fourth-placed Manchester United and just one more than Chelsea in sixth. Fifth-placed Arsenal are also a point behind Spurs, but they will move up to third if they avoid a home defeat by Newcastle on Monday (20:00 BST kick-off). “It is now a mini-league and there are seven games left, but we are in the top four,” added Pochettino. Tottenham will begin their long-awaited tenure at their new stadium against Crystal Palace in the Premier League on Wednesday (19:45) and Pochettino says his players are “heroes” for maintaining their position “in the circumstances”. Spurs, who have played homes games at Wembley this season, were scheduled to move to the new White Hart Lane stadium in September but construction was delayed several times. “Now we start from zero and we can achieve what we want,” said the Argentine. “You cannot only judge us on the position in the table but all the circumstances, like playing at Wembley.